I love Kati Rolls, a sort of wrap made with paratha bread, typical street food, that originated in Kolkata, India. So I was excited to go to Desi Grub, a place we found walking on 40th, on our way to Port Authority. It is a small place, with just few seats and an open kitchen from where they will cook your rolls to order. My favorite roll is the shami kebab that is very flavorful (I love lamb so it is an easy sell) and my least favorite is the spicy shrimp as I thought the shrimp were way overcooked. I love their bread that is delightfully greasy. One roll is fine if I want to be reasonable, but I do not mind a second one as they are of a decent size. As a beverage, each time we went, we got their mango lassi that is very good, and perfect if your mouth is on fire. 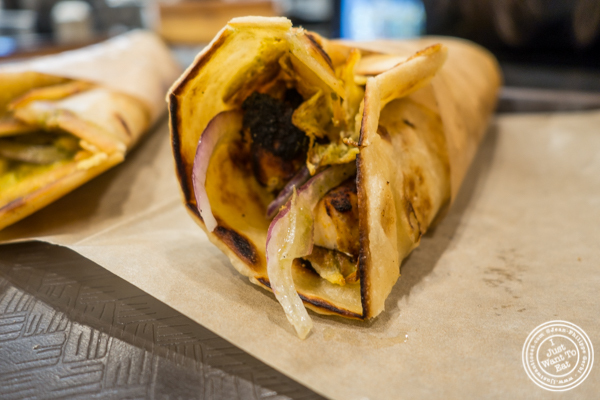 I like Desi Grub: it is not at the level of The Kati Roll Company that is few blocks away, but I find their Kati rolls pretty good and reasonably priced.